The survey was conducted from Apr to May 2013 for the reporting period of FY2012 (i.e. 1 April 2012 to 31 March 2013). 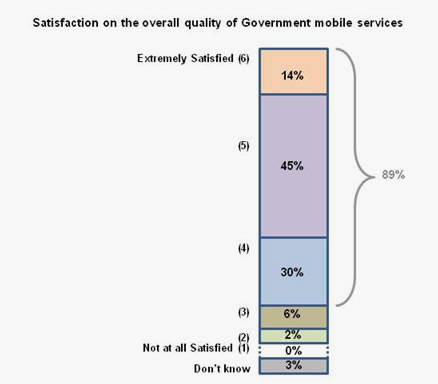 The survey aims to determine the level of satisfaction in using Government electronic and mobile services. 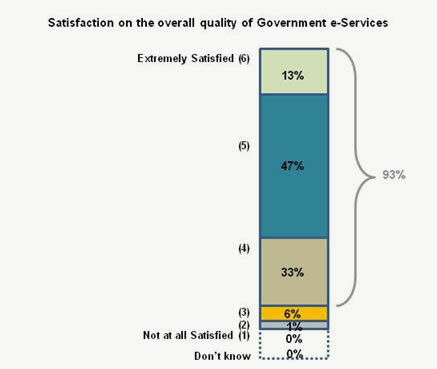 More than 9 out of 10 (93%) businesses were satisfied with the overall quality of Government electronic services, of which, 60% gave a rating of 5 and above. More than 8 out of 10 (89%) businesses were satisfied with the overall quality of Government mobile services, of which, 59% gave a rating of 5 and above.